It’s hard to believe 4th of July is less than three weeks away! This summer has just been flying by. 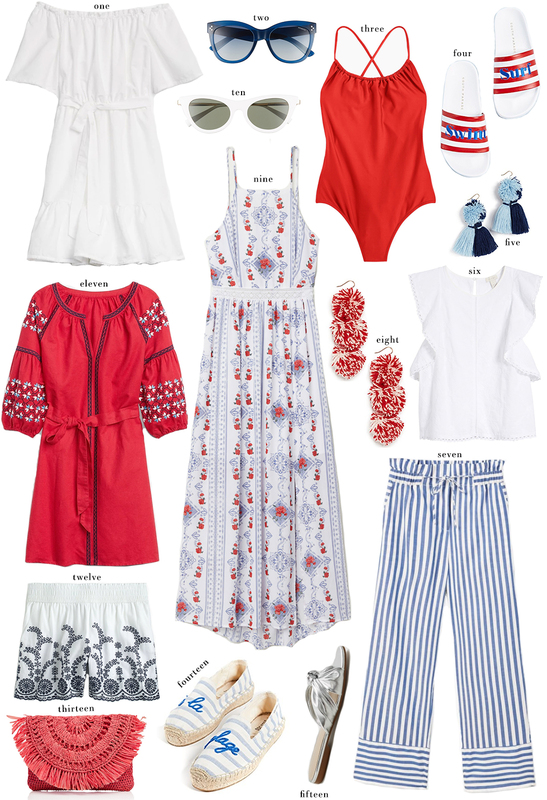 If you’re heading somewhere warm this holiday, check out these festive looks in red, white and blue. Shop even more patriotic pieces under $100 below! If you’re planning to wear a bandeau bikini to the pool/beach, try this fun red romper as a coverup. The silhouette is super cute and the broderie anglaise makes it look way more expensive than it is! This blue + white striped midi dress is ideal for any daytime activity if the temps are really high. Super lightweight! This red maxi is on sale for under $50! Together these pieces are over $100, but separately they are not! I just love it for a backyard barbecue. This striped shift is an easy, comfortable silhouette for travel days. It could also be worn as a coverup! Pair this short sleeve shirt with jeans or shorts for a casual daytime look. This dress and this dress are nearly the same, but with one minor detail changed. Also, both are under $30! These tie-waist denim shorts are only $17! This jute crossbody is a chic summer accessory you can wear with nearly anything. These red sneakers are perfectly festive and very comfy! I can’t believe the 4th is coming up! I love #9! Those earrings and the stripped trousers are fabulous! Often I feel like people think you can only wear red, white, and blue on the Fourth of July, however, this is one of my favorite colour combinations and wear it more often than not. I also feel like it’s very Parisian as well which is my style so it’s like a win win!